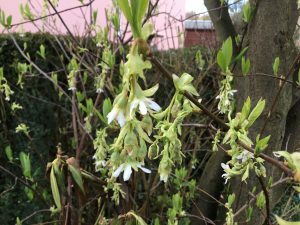 The cold spring continued far longer than welcomed but it wasn’t all doom and gloom for gardens as has meant that some plants have flowered for longer than expected. For example some of the early flowering Daphne’s, Snowdrops and Aconites. As we have had some very cold temperatures there is also the chance that there will be less pest attack this spring. One can only hope! Lots of plants are starting to grow and just need the sun and some warmth to encourage them along. With this in mind I am looking at some of the stalwarts that flower whatever the weather. 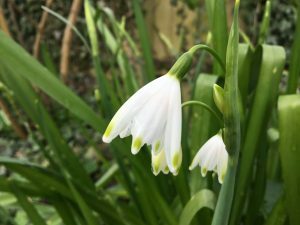 A stunning and elegant spring bulb that produces pure white nodding flowers which are delicately tipped with green. It is ideal for any position in the garden as long as it is not too dry or too windy as it can get flattened in an exposed site. I find that it does well in a semi-shaded spot where its flowers really stand out. Like all bulbs allow the foliage to die down naturally so that all of the goodness goes back into the bulb for next year. A great bulbous perennial that has pale grey-green ferny foliage and dainty rose pink flowers with a white stripe appear in April. 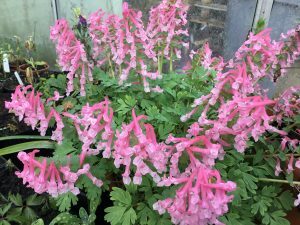 It will grow in any soil as long as it is well drained and makes a great addition to a rock garden, mixed border or as a stand-alone plant in a container. As the flowers age they fade to a lovely pale pink. 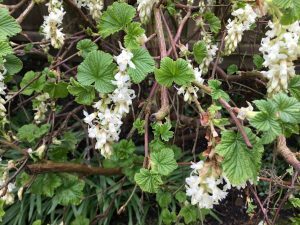 One of my favourite early spring flowering shrubs that is as tough as old boots. It can grow almost anywhere from quite dense shade to full sun and in a variety of soils from quite dry to quite moist. It needs a bit of time to get going but when it does it rewards you with masses of pure white cascading flower spikes that have green calyx’s. It is tolerant of an open position and unlike some winter shrubs seems to revel in the colder frosty gardens. 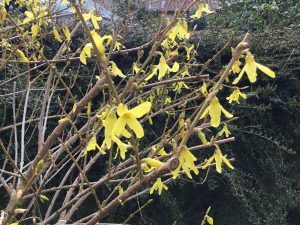 Pruning Tip – To encourage it to produce more side shoots and therefore more flower trusses for next year, prune it a couple of times during the growing season and that will stop it becoming a bit straggly. This unusual shrub is ideal for a woodland setting or a north facing position as it does prefer some shade. It flowers on almost bare stems and produces drooping catkins that have white scented flowers. The light, fresh scent is reminiscent of almonds. It is a suckering shrub and grows to about 2m (6ft) tall eventually. The leaves are oval and elliptic in shape a good bright green. My one at home flowers for about 4-6 weeks depending on the season and I grow a late flowering Clematis vitcella ‘Alba Luxurians’ through mine so that I have a similar colour in that part of the garden later in the year. A familiar spring shrub in many gardens but one that is often overlooked at this time of the year for it shear brilliance. It is popular because it will tolerate a huge range of aspects and soils, growing almost anywhere which makes it so invaluable. Tough and durable even if neglected it can be cut back hard to regenerate it and within a year or two will be back to its best. Ideal at the back of the border or as a hedge and for the novice gardener. A shade loving, early spring flowering tough herbaceous perennial. This plant will grow in quite dry soils I find at home. It can be a bit invasive but well worth a try if you have a shady spot where things struggle. Short 60cm (1ft) tall flower spikes of reflexed cornflower blue flowers appear in late March into April, followed by large, rough textured leaves that persist into early winter. It will tolerate quite dense shade and is ideal along the base of hedges and under trees. Very good for insects. 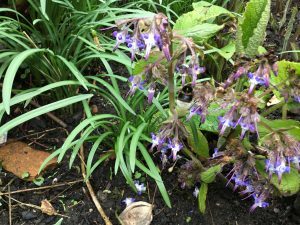 Frost damaged plants – looking around the local gardens the winter does seem to have caused some damage to certain types of plants, especially the less hardy forms. It may not be until May that the true extent of what has been caught will be seen. With plants that have been damaged wait until there is some regeneration of growth before cutting them back, just in case we do get a late frost which will damage cut back plants further. If it has not been cut back the frost will work on the old damaged growth and therefore protect the newer shoots lower down. As soon as the new growth has reached a few inches in height the damaged shoots can be cut back. Sunday 29th April – Garden Open in aid of the National Garden Scheme. 2-5pm. Sunday 13th May – Garden Open in aid of St Elizabeth Hospice. 2-5pm.